The state of regional Chinese cuisine in Chicago has never been better. Recently we've seen the opening of dongbei restaurants in Bridgeport (Homestyle Taste), a couple worthy szechuan alternatives to Lao Sze Chuan (Szechuan Cuisine and Chengdu Impression), and of course the various regional cuisines represented by the Tony Hu empire (most notably Lao Hunan). So it's no surprise that a restaurant dedicated to the cuisine of Xi'an has opened up in the space recently vacated by Yee Heung Seafood House, a couple doors down from the board's namesake. I'm far from an expert on the cuisine having read a little about it on Serious Eats and on the homepage. 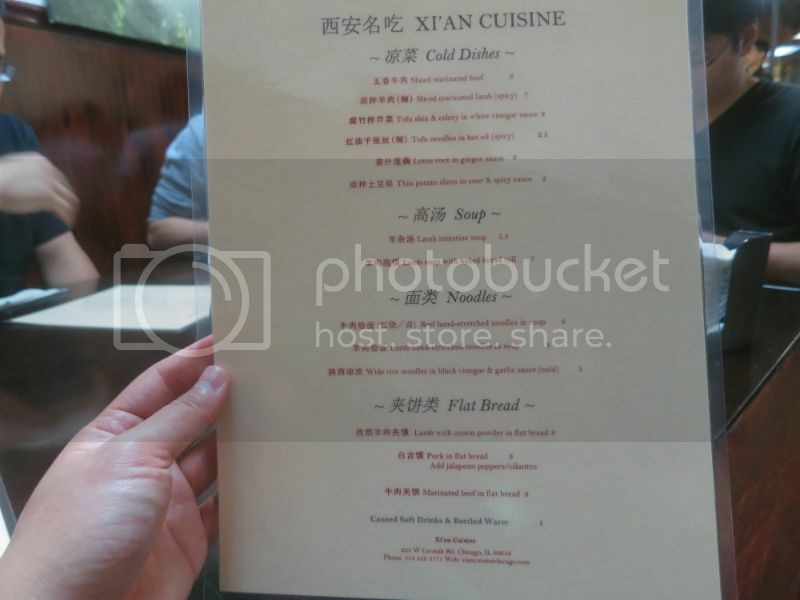 I ate at New York's Xi'an Famous Food last year, though I wasn't that impressed. The restaurant is pretty new, I haven't been able to find anything written about it online and the room smelled of recent construction, but the word has gotten out to the Chinese ex-pat community. We visited this past Saturday night and the line was out the door. From looking around the room it seems that this food isn't really meant to be shared. Everyone orders their own bowl of soup/noodles and supplements it with a small sandwich called "flat bread" on the menu. The cold dishes, which are shared, are meant as accompaniments to the soup rather than as standalone appetizers. The tofu skin with celery is marinated in a white vinegar sauce. I'm a big fan of the simple dishes you see in a lot of Chinese cuisines that marry two or three basic flavors and textures together in perfect harmony (personal favorites are the tofu with scallions and thousand year eggs and spinach with peanuts and vinegar at Homestyle Taste). While much of Chinese cuisine pays special attention to the balance of textures, the cuisine of Xi'an appears to be emphasize this even more. This sour, crunchy dish is a terrific balancing force next to the rich and complex noodle dishes. The tofu noodles in hot oil are a simpler dish that I suspect are meant to be paired with one of the soups we didn't order. They are seasoned with a mild chili oil and black vinegar, but they paled next to the more complex cold noodle dish we ordered that hit many of the same notes. 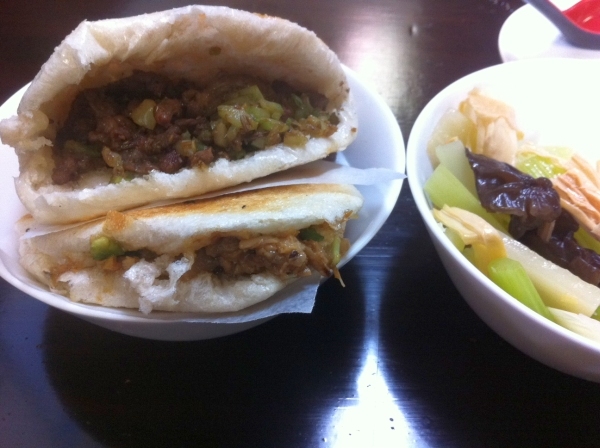 It was good with the boiled beef bun, though. If I order this dish again it will be with an eye towards pairing it with one of the more substantial noodle soups. They were experiencing some jitters probably due to the overwhelming interest they've received so soon after they opened. The wait staff and kitchen seemed somewhat overwhelmed and unfortunately some of the items on the menu had sold out even early on a Saturday night. We were even seated at a table with other diners so they could serve more guests. So unfortunately we weren't able to try the lamb with cumin powder flat bread and ended up ordering the marinated beef instead. If you scroll down the seriouseats article you'll see a pinkish beef sandwich that looks like chopped corned beef. I was hoping for something more like this rather than the simple soy-sauce and anise braised beef that I've had many times at Chinese supermarkets and from the refrigerator at Katy's in Westmont. It's a fine rendition but nothing I'd go out of my way for. Now onto the star attractions. 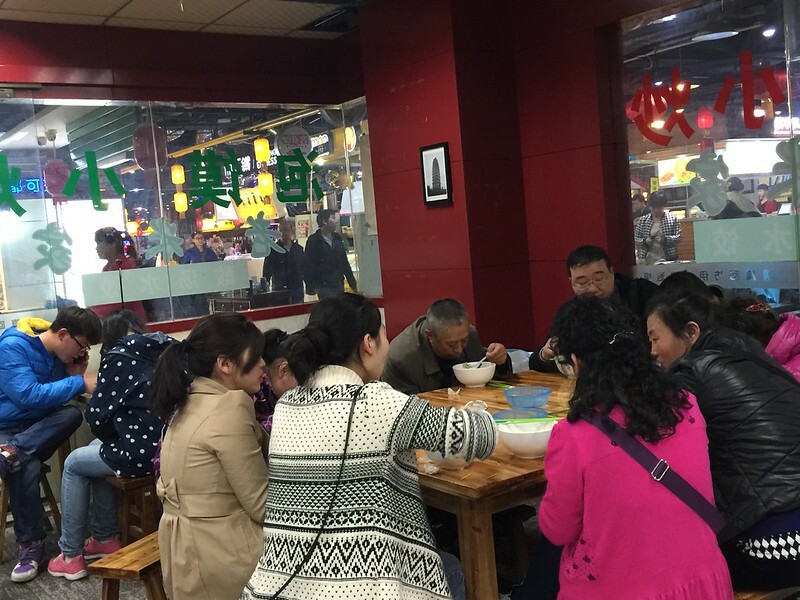 Liangpi cold noodles are perhaps the most famous dish from Xi'an. The noodles are meant to be thick and springy and this rendition was exactly that. The picture shows a small dab of an intensely flavored paste made of roasted chilies, sesame paste, and black vinegar on top. Remarkably, that dollop resulted in an explosively flavorful plate of chewy noodles and crunchy bean sprouts swimming in a pinkish-red sauce. The roasted chilies were the key, almost cumin-like with their aromatic depth. This is as satisfying as a plate of cold noodles can get. The lamb noodle soup is served in a luscious lamb-bone broth that is rich with gelatin and deliciously lamb-y without being too funky. The pliant hand-stretched noodles, uneven in width and thickness, played off the firmer tofu noodles and fork-tender hunks of lamb in a way that made each bite texturally interesting. The table had white pepper and chili oil for those who wanted to amp up their soup, but for me (and I rarely say this) the soup needed no enhancement. If I had a gripe it's that the menu seems to be somewhat limited. I only say this because there is so much more of Xi'an's cuisine I'd love to try and this kitchen obviously knows how to deliver the goods. My next meal there (and there will be a next, probably soon) will likely resemble my first. I'll pay closer attention to how the flat breads and cold dishes augment the soups/noodles to make for a better overall meal. Interesting looking place, menu is indeed tiny, looks like nothing over $8-$9? Bonus points for the thread title. We had an enjoyable impromptu group meal here last night. The 9 of us were able to put back 2 of everything on the menu, plus 3 of a few things, and the bill was still only $18/pp after tip. This is definitely a budget dining option. The table favorite, at least at my side of the table, seemed to be the cold noodles (~$5), the broth in which it was served was tangy, extremely rich, borderline too salty, but addicting. I saved some in a small bowl and mixed a boatload of chili oil into it and it made for a hell of a dipping sauce. The house made spongy noodles were great, though I still prefer the dense dumpling-like hand stretched noodles. While I enjoyed the complexity of the cold noodle broth, I think the lamb noodle soup pushes slightly into first place (maybe), just because there is no other place in Chicago to get this style of hand stretched noodles and I love them. 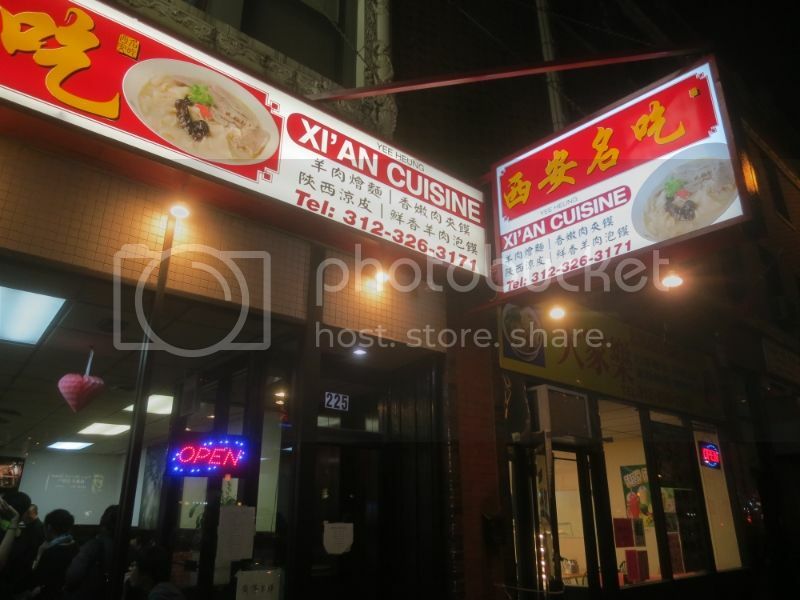 They were right up there in quality with Xi’An Famous Foods and Biang Biang in flushing. The broth was milky white from boiling the bones, very mild and soothing, similar to Seolleongtang, and a dead ringer for the lamb broth served in the goat hotpot at homestyle taste. So much so that I asked the owner (I think he was the owner) if he was from Xi’An or Dongbei, and he was shocked that I guessed it, Donbei. Perhaps it was a coincidence, I don’t know. I thought the hand sandwiches were excellent, the lamb was tender, and the pork was like a funky pulled pork, with lots of sticky skin and fat mixed in. The beef was not as interesting, they simply stuffed some of the cold beef appetizer into the bun and called it done. I was less impressed by the cold appetizers, and I’m dubious as to the notion that they’re meant to be put into the soups. I don’t doubt that turkob saw people doing that, but I did not. At least in my opinion that would have done nothing to help the appetizers taste better, nor would it improve upon the soups. Of the menu of cold dishes, the only two that I’d bother ordering again would be the lamb, which was a nice mix of gristley bits and tender chunks, and the celery and tofu skins which was really fresh and crisp and went as a nice compliment to the hearty soup. I would definitely not recommend ordering the beef noodle soup. While the broth resembled the lamb broth, it lacked any kind of flavor, not even salt. Maybe it was an off day for it, or maybe they forgot to add salt, after all this was my first visit, but with the lamb soup on the menu, I won’t bother ordering it again. I’m sure I forgot to cover some of the menu items, maybe I’ll chime in later as more people comment. Looking back at the menu, it appears that whoever was ordering (I’m looking at you Jazzfood) forgot to put in the order for the lamb intestine soup! Will have to try that one out next visit. I chatted a bit with the owner about the regional aspects of the food and he told me that the chef who created the recipes for this menu lived in Xi’An for 5 years and that’s where she learned to cook Xi’An cuisine. Let me backtrack and say that I know next to nothing about the cuisine of Donbei vs. Xi’An, I’m simply relaying a conversation as it happened. For all I know, every dish in the place could be very much Xi’An cuisine. The biggest critique of the restaurant as a whole would be that there are no spicy or mala forward dishes here like there are at Xi’An Famous, or Biang. Maybe the cuisine of Xi’an is less spicy than my experiences in flushing led me to believe, or maybe the places in flushing are amping it up. By no means would I want to downplay the fact that the people at Xi’An Cuisine know how to make the noodles the right way, they certainly do. laikom wrote: I was less impressed by the cold appetizers, and I’m dubious as to the notion that they’re meant to be put into the soups. I don’t doubt that turkob saw people doing that, but I did not. At least in my opinion that would have done nothing to help the appetizers taste better, nor would it improve upon the soups. Of the menu of cold dishes, the only two that I’d bother ordering again would be the lamb, which was a nice mix of gristley bits and tender chunks, and the celery and tofu skins which was really fresh and crisp and went as a nice compliment to the hearty soup. Sorry I didn't mean to make it sound like they were meant to be put in the soups. I meant they are a side dish meant to be eaten along with the soups, much as you describe the celery with tofu skins. I agree the tofu noodles and beef bun were both pretty bland. I saw people poking at them between bites of soup, but never put them in the soup. Sorry I didn't mean to make it sound like they were meant to be put in the soups. 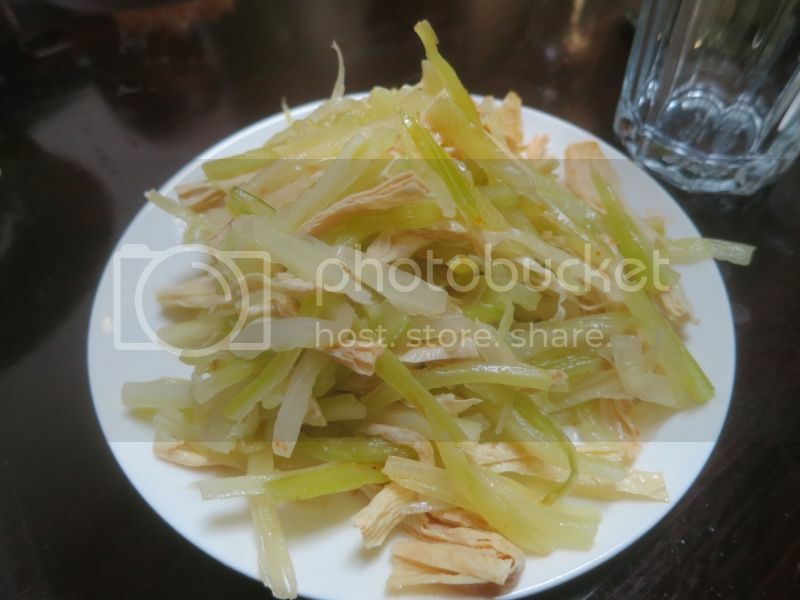 I meant they are a side dish meant to be eaten along with the soups, much as your describe the celery with tofu skins. Ooooh... that make a lot more sense. My poor reading comprehension strikes again. I just realized that we were not served the lotus root cold dish. It's also worth mentioning that the staff told me they plan to expand the menu in the near future after they get their bearings straight. They plan to add skewered grilled meats, as well as some of the more spicy options. Fun meal--and nothing to add on the food since Laikom and my tastes were pretty well-aligned last night. I would just add that I thought the service was really good--not the typical Chinatown brusqueness (not sure if that's a word but you get the idea). I would guess that our ordering style--no real point person and a kind of confusing "we'll have 2 of this and that and everything" probably resulted in the few missing items (and, at that, they may have been missing because they were out of them--they were down to one order of the celery salad last night). They even cut our little sandwiches into quarters for easy sharing without being asked. For those who may want to stop in solo, I'd heartily recommend an order of the celery salad, a pork bun and the cold noodles for a really nice lunch. If you have a partner, add the lamb soup. And I hope they can make a go of it with those prices--the solo lunch I recommended will set you back a whole $10 and unless you're starving, you'll probably go home with an extra meal! Looking forward to a return trip. laikom wrote: it appears that whoever was ordering (I’m looking at you Jazzfood) forgot to put in the order for the lamb intestine soup! boudreaulicious wrote: a kind of confusing "we'll have 2 of this and that and everything" probably resulted in the few missing items (and, at that, they may have been missing because they were out of them--they were down to one order of the celery salad last night)... heartily recommend an order of the celery salad, a pork bun and the cold noodles for a really nice lunch. If you have a partner, add the lamb soup. I ordered the soup, but it was not to be, and agree w/Jen's recs. Quite enjoyed lunch here today. Those prices! The cumin lamb flatbread + the tofu skin and celery salad might just be my favorite new lunch for $5. We ate much more than that between the two of us, though those two dishes were the highlights. Loved the textural interplay of the celery dish, a dance of crunch and chew, seasoned aggressively with vinegar. Unlike turkob's photo upthread, ours had wood ear mushrooms in the mix for more chewy fun. Loved the juicy, well seasoned lamb in the crunchy griddled bread as well. We also got a pork flat bread, which I also dug, though the bread was entirely crunchy and lacked a bit of the textural depth of the other. The pulled quality of the pork reminded me of the "pork burger" at the food stall at Richwell Market. My dining companion, a New Yorker, remarked that both flat breads were a lot like what you might find at food stands in the big city. Sliced potato with vinegar and chile oil was a familiar dish from versions at Ed's, Northern City, and Homestyle Taste. 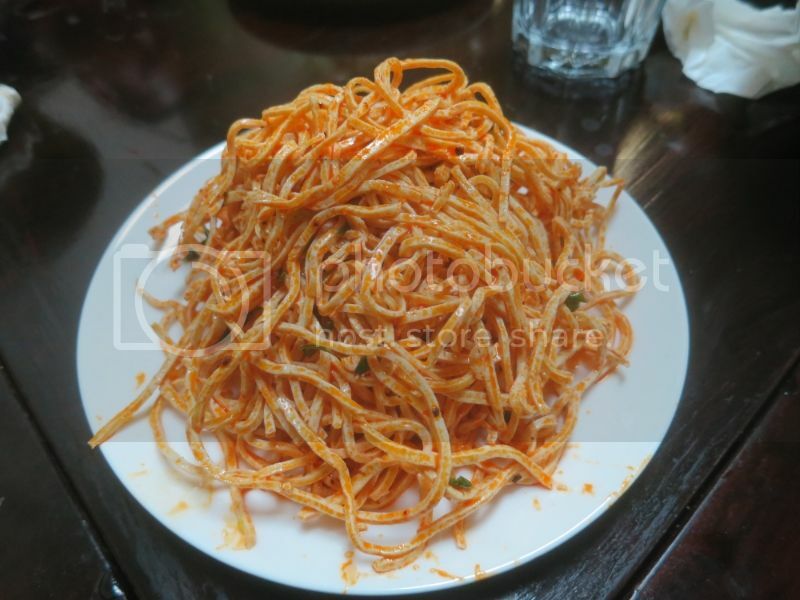 It was julienned very fine here, though maintained an al dente crunch, which I find very pleasing in a potato dish. Also enjoyable was an order of boiled peanuts, which were in fact very much like the Southern American fave and pehaps the best version I've had in the north, salty with a subtle hint of star anise. The one dish that I did not love was the lamb noodle soup. It had mostly to do with fact that the broth was on the tepid side and the noodles were starting to sog. I have a feeling it might have sat on the line for 5 minutes or maybe we were too pre-occupied with the other goods and conversation. I can see a piping hot bowl zipped up with chile oil as a pretty satisfying wintertime respite. Good stuff. Had a great meal this evening. Just a few of us so didn't get to order a lot, but everything we got was great. My favorites were the pork flat bread, which is chopped up pulled pork in a somewhat spicy sauce, and the stir fried noodles. The noodles were stretchy and really tasty. Got it with lamb which was simply stir fried in soy sauce so nothing special and actually couldn't tell if it was beef or lamb. Also got the lamb flat bread, peanuts, and celery with tofu skin. All were enjoyable and the meal came out to under $25 for 3 people. Highly recommend. I missed this thread earlier. Based on Steve Dolinsky's report on the cumin lamb flatbread I stopped in today after the Housewares Show. Lamb was great, good balance of flavor and the slight chew to the bread was a nice counterpoint. If only I had stopped there. Not looking too hard, I saw beef noodle soup with hand pulled noodles. I was expecting niu rao mein but I got a bowl of pretty mushy flat noodles that were unlike any hand noodles I've had before. The slices of beef were good but the broth was utterly flavorless. Not what I was expecting. I asked the waiter if this was the same dish that I knew as NRM and he got pretty snippy with me. "That's ramen and not hand pulled you do not know what you are talking about this is the only beef noodle soup"
Ok then. Paid up, left a tip on top of the 1$ surcharge and left. laikom wrote: I would definitely not recommend ordering the beef noodle soup. 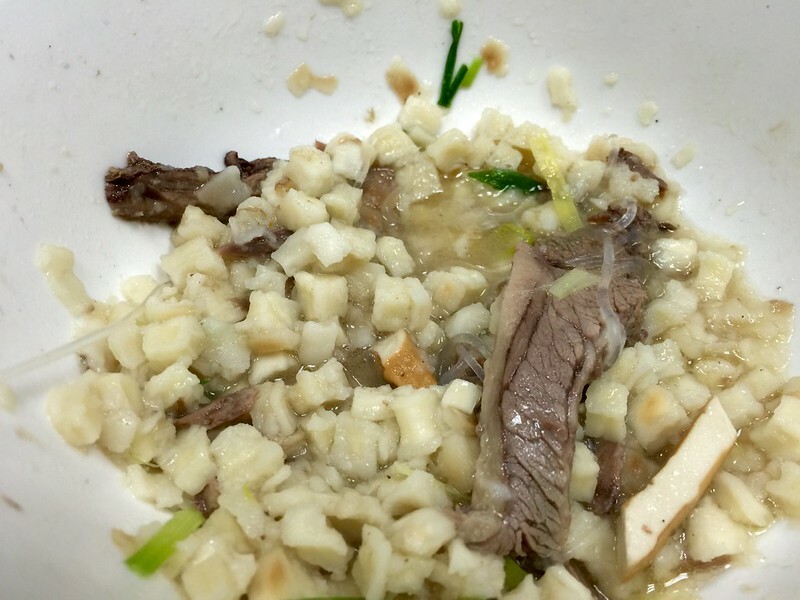 While the broth resembled the lamb broth, it lacked any kind of flavor, not even salt. Maybe it was an off day for it, or maybe they forgot to add salt, after all this was my first visit, but with the lamb soup on the menu, I won’t bother ordering it again. Octarine wrote: If only I had stopped there. Not looking too hard, I saw beef noodle soup with hand pulled noodles. I was expecting niu rao mein but I got a bowl of pretty mushy flat noodles that were unlike any hand noodles I've had before. The slices of beef were good but the broth was utterly flavorless. Not what I was expecting. Looks like you're both saying don't order the beef noodle soup. Yep. Wish I had read this thread more carefully. The sammiches were good, go for those. Just visited. Cold noodles were delicious. Daughter ordered the beef soup (I advised her to pick lamb, but she prefers beef), and a pork bun, plain without chilis and cilantro. All very tasty, obscenely cheap (about $15 for two). 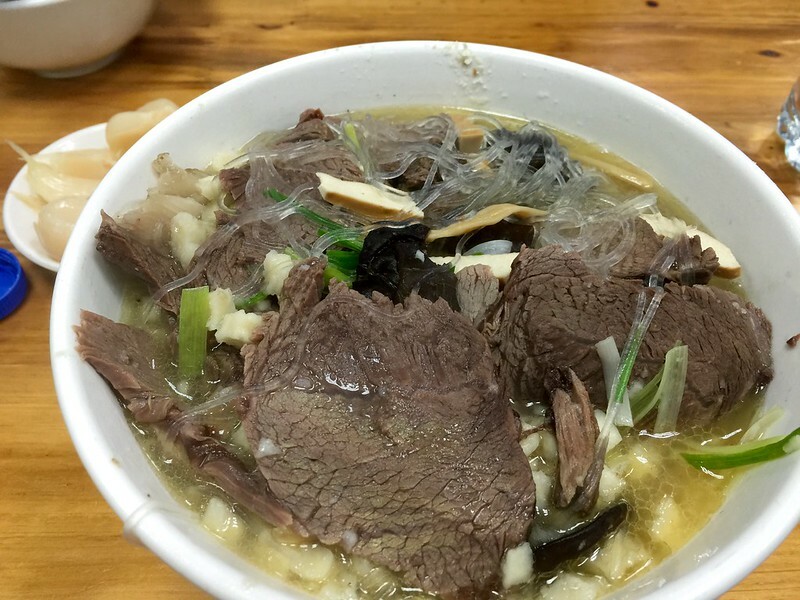 A friend also reported going last week, and he enjoyed the beef noodles. I did sample them, though not eating any of the beef. I agree that the broth is mild but found it tasty enough, even better with some chili oil added. As for the noodles being mushy, that would not be specific to that soup, as all the noodles we had (in the beef soup and cold noodles) seemed the same to me. Am I wrong on that? I will definitely try the lamb noodles when I can, but I do not agree that the beef is a bad choice, just not as exciting as the cold noodles with their dollop of garlic and chili oil (though I added a bit more to them, too). The cold noodles will make a perfect summer snack. I tried the lamb intestine soup and thought it was quite satisfying, but very light in the use of intestines. The meat mostly seemed to be sliced tripe, liver, kidneys, some muscle meat (I suspect some sliced heart, possibly), and a little bit of small intestine. No large intestine. Cellophane noodles, which were used very sparingly, added some substance, with woodear mushrooms contributing some textural variation. Jefe wrote: Quite enjoyed lunch here today. Those prices! The cumin lamb flatbread + the tofu skin and celery salad might just be my favorite new lunch for $5. We ate much more than that between the two of us, though those two dishes were the highlights. Loved the textural interplay of the celery dish, a dance of crunch and chew, seasoned aggressively with vinegar. Unlike turkob's photo upthread, ours had wood ear mushrooms in the mix for more chewy fun. Loved the juicy, well seasoned lamb in the crunchy griddled bread as well. We also got a pork flat bread, which I also dug, though the bread was entirely crunchy and lacked a bit of the textural depth of the other. The pulled quality of the pork reminded me of the "pork burger" at the food stall at Richwell Market. This was spot-on with my experience, though I did ask for the peppers and cilantro in the pork bun, and thought that made a strong showing, actually better than Gene's Flatbread Cafe in Boston, which I visited in February. I was very happy at Xi'an and can't wait to visit again for a lunch soon. Incidentally, compared to another table of newbies across from me informed by Dolinsky (which they let everyone in the restaurant know), I felt like I had a significant leg up on understanding the portions and flavors through this thread, and better results because of it. I can't argue with the prices for the quality of food here. However, nothing was amazing and we thought the cold noodles were incredibly bland without a pile of very good chili paste and zhenzhiang. I think ours was completely bare on top in contrast to what others described. I did enjoy the potatoes slivers in chili oil, maybe my favorite version of this simple appetizer, and the celery and tofu were better than expected (hard to get excited about celery). Of the bing, the lamb one was of middling cumin flavor, but the pork one was tasty and came with a better griddled exterior. The lamb soup was also excellent. This is a place that may just end up in the rotation because the price to quality ratio is so good. Celery & tofu skin + lamb flatbread (both even more delicious this visit than previous) are have earned the bump from $5 together total to $6.50, among some other menu tweaking. Help yourself to a skewer of lamb testicles, and soup offerings have been expanded (including some with flatbread). Next thing the gringo tax is going to hit - and I'll be laughing on the road to hell while it happens: beef dumplings ($3). Why is anyone waiting in line at Fat Rice? Unctuous, homemade, and dat lace. The only that approached this so far in 2015 were Jackie Shen's in New Buffalo. 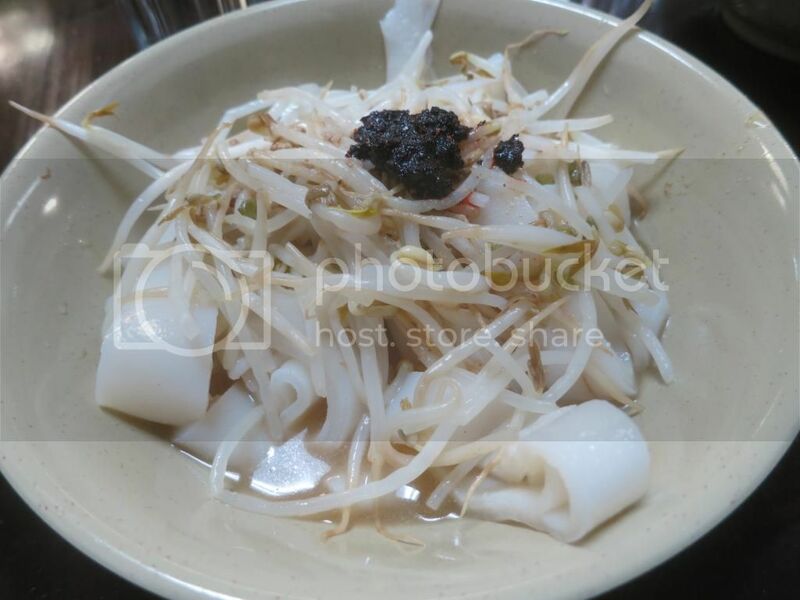 Has anyone tried their yangrou paomo? That seemed to be one of the most popular dishes in Xi'an (if not the most popular) and I absolutely loved it. I see they have it on the menu so I'll have to give them a try. I brought home a bagged version that I've yet to make (you can buy anything in a bag in China -- even duck!). I just wanted to let everyone know that they have greatly expanded their menu recently. Also the food was even better on my second trip. For the price, that pork bing is the best sandwich in Chicago. I also enjoyed the heck out of the vermicelli and spinach in Zhenjiang vinegar but then spinach+black vinegar is one of my favorite combinations. I also tried some lotus roots in ginger, but it was merely OK with very little ginger flavor. I ended up adding a bit of vinegar to it to up the flavor. I saw a table with the paomo and it is basically the lamb soup with bread in it. They make a very nice and gelatinous lamb broth so if you enjoyed that and the idea of soggy bread appeals to you it's probably good. botd wrote: I saw a table with the paomo and it is basically the lamb soup with bread in it. They make a very nice and gelatinous lamb broth so if you enjoyed that and the idea of soggy bread appeals to you it's probably good. I probably wouldn't describe it as soggy bread. If they're doing it right, it's a very dense, unleavened bread that when broken up in the soup offers a texture akin to little dumplings . . . instead of chicken and dumplings, think lamb and dumplings (with acccompanying pickled garlic and hot sauce). Sure, I was mostly being facetious. I would definitely try it if my wife weren't such a glutton for noodles. Though I will be honest and say that bread is rarely my thing and unleavened bread is even less appealing. Santander wrote: Celery & tofu skin + lamb flatbread (both even more delicious this visit than previous) are have earned the bump from $5 together total to $6.50, among some other menu tweaking. Help yourself to a skewer of lamb testicles, and soup offerings have been expanded (including some with flatbread). 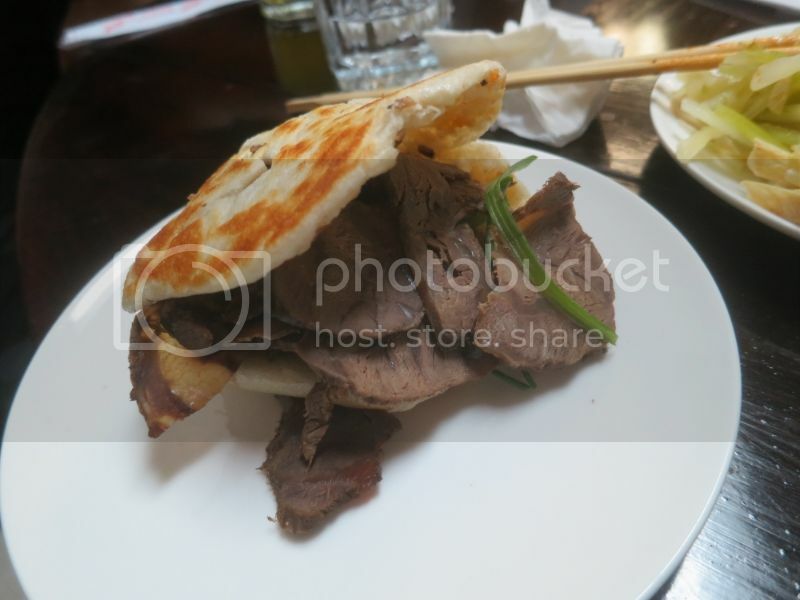 I checked out a few of the new menu items (alongside my cumin lamb flatbread and celery and tofu skin) at Xi'an last week and continued to be impressed. The dumplings praised above by Santander are indeed of the fabled lacy matrix style, which outside of Fat Rice, I have never had in Chicago. They're great, especially for $3, though I felt the filling could have used a bit more punch, garlic or ginger perhaps. The abundance of glass noodles in the filling, while texturally cool, stretched thin the mild profile of the beef. But with that crisp/ chewy interplay and enough black vinegar/ chile oil mix, who's complaining. I was more stoked about one of the many new noodle offerings: Hand-stretched noodles in hot oil, vinegar, & soy sauce. Chewy and pleasantly doughy hand-pulled noodles that had an irregular cut, a tooth you might say. They were served room temp and the familiar vinegar/ chile oil dressing with a scattering of cool scallions made for good hot weather eating. I have tried both dumplings at Xian. They are certainly solid, but not particularly outstanding as guo tie go. 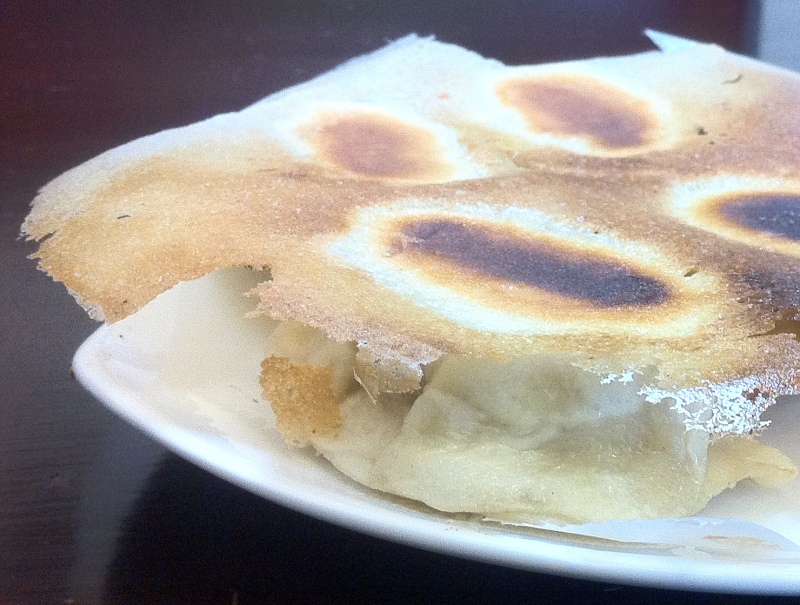 The lacy webbing can be replicated by adding a bunch of starch or flour to the outside of the dumpling before frying. While aesthetically nice, I don't find it adds anything to the flavor. 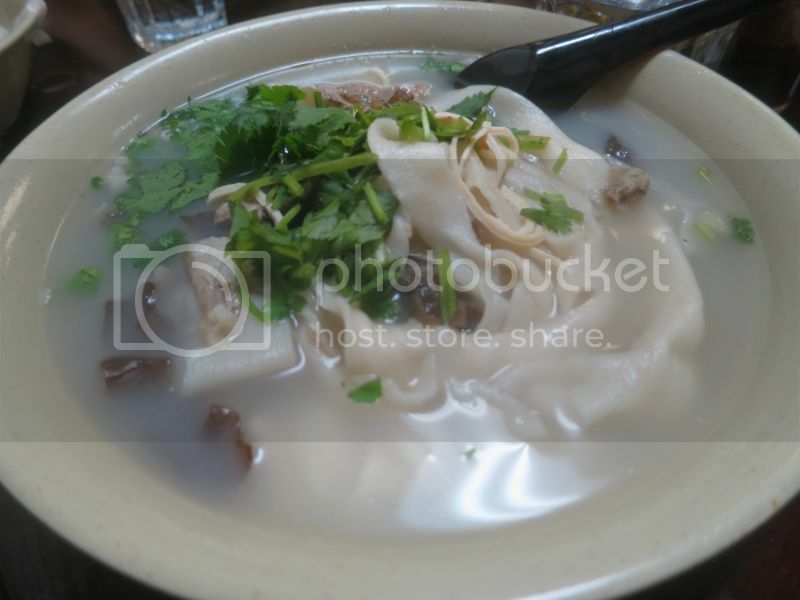 So I took one for the team and ordered a bowl of yang rou pao mo or lamb soup with bread. I will be honest, I don't get it. I can of course concede the necessity of it in a poor peasant community. Every culture has ways of adapting stale bread products (french toast, bread pudding, etc. ), but I am not sure this is really preferable to just dunking stale bread into soup. Fun fact: the word for soup comes from latin suppa which is bread soaked in liquid. Also this soup is HEAVY. This is some dense bread and they put a lot of it in. Because of the density the bread holds up decently well to sitting in soup broth. The soup broth was delicious as always and I still enjoyed the dish. We also ordered the seaweed salad and woodear mushroom cold apps. Both were excellent and of course cheap. I highly recommend an order of mushrooms to dip into your lamb soup, it works really well IMO and this is coming from someone that is typically skeptical of the culinary value of woodears. 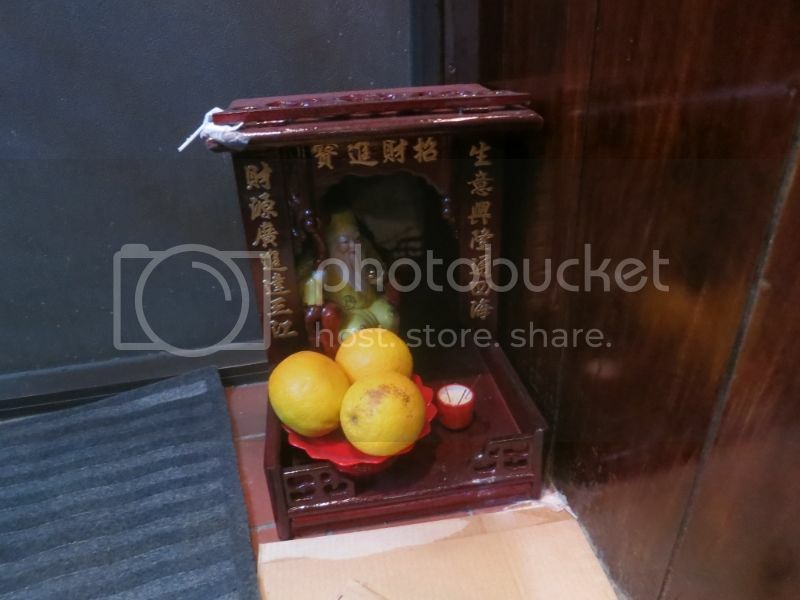 I don't think Xi'an is especially known for vinegar, but this restaurant uses it with deft skill. Dumplings are very apt way of describing them. However, I remain fairly skeptical of pure bread dumplings in general, e.g. matzo ball soup. I should reiterate that I still thoroughly enjoyed the bowl, but I am fairly sure that I would have enjoyed it more with just glass noodles. 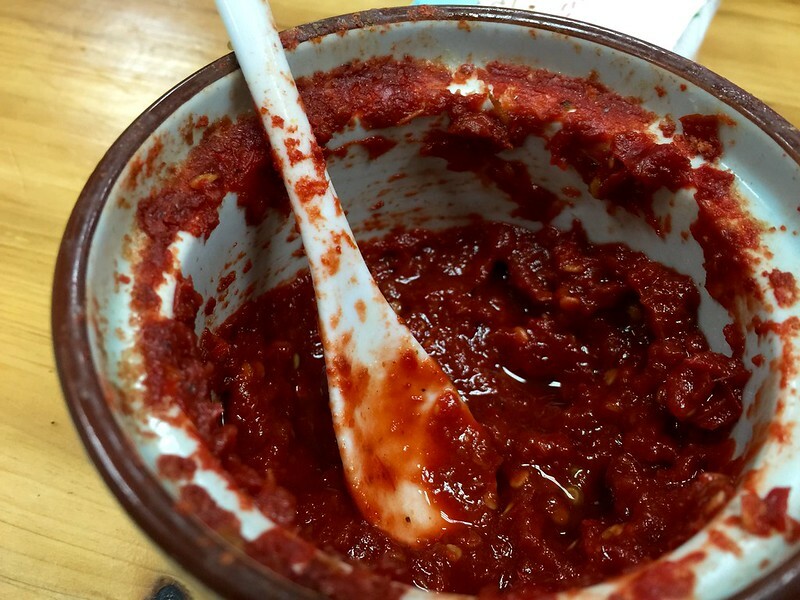 Also that chili paste looks REALLY good. Xi'an is definitely a place I need to get to at some point. 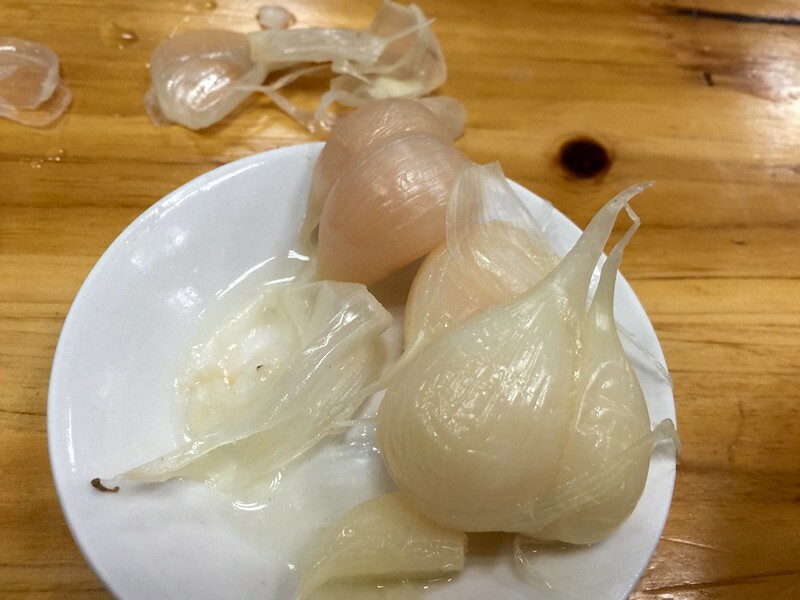 Does Xi'an Cuisine serve pickled garlic? I don't believe I saw it there.